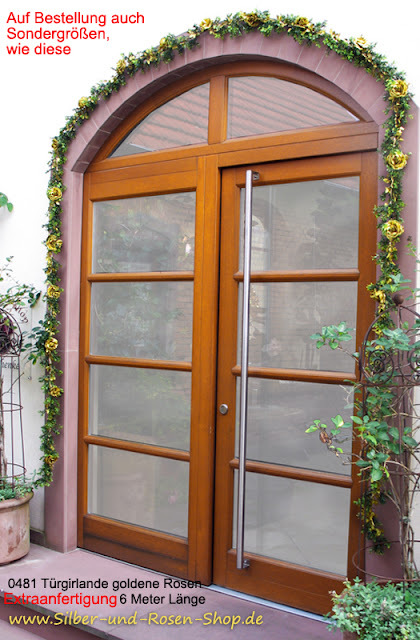 Hagebutten gehören auch zum Herbst. Rose hips belong also to fall season. Im November brauchen wir früher künstliches Licht. Kerzen erhellen mit ihrem sanften Schein nur einen kleinen Bereich. Das gibt dramatische Effekte. Ups, schon fast 5 Uhr - Zeit für den Tee! In November we need earlier artificial light. 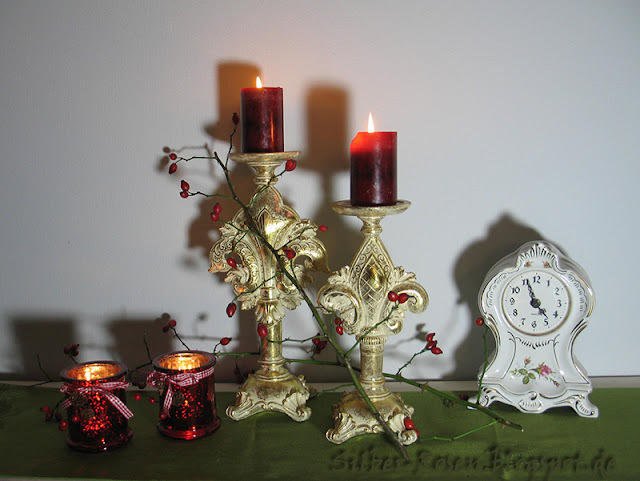 Candles illuminate with their mellow glow only a small area. That causes dramatical effects. Oops, already fice o'clock - time for tea. Ich habe alles auf einem Tablett angerichtet. Es gibt Hagebuttentee und Kräppl (Berliner) mit Hagebuttenmarmelade gefüllt. Natürlich nur wegen der Vitamine. I have set a tray. We will have rose hips tea and Dumplings, filled with rose hips jam. Just because the vitamins, you know! Wir setzen uns ins Wohnzimmer. Dort sitzen wir bequem und können uns beim Tee unterhalten. Lets sit in the living room. There we sit comfortable and we can talk together while we enjoy the tea. Siehst du, ich habe eine Kräppl durchgeschnitten, damit du die Füllung sehen kannst. So kommt keine trübe Stimmung auf. Look, I have cut the dumpling, so you can see the filling. To have tea that way makes a good mood. Die Wochen vergehen jetzt schnell. Bald ist schon wieder Weihnachtszeit. The weeks are running fast now. Soon we will have Christmas time. Auch wenn ich mich nur selten bei euch zeige, ich freue mich über jeden Besuch und Kommentar von euch. Although I am seldom in Blogland, I am happy about everybody who visit and comment. 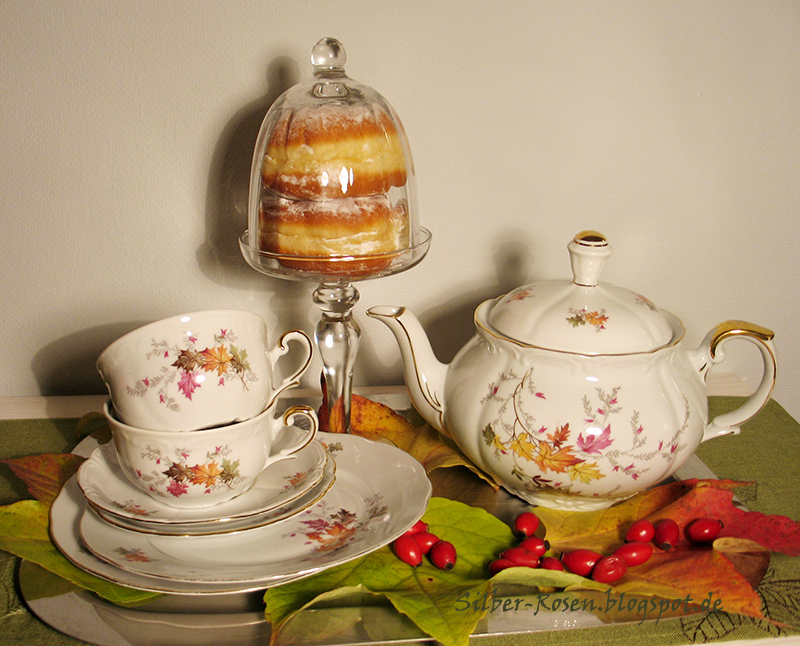 Johanna, your autumn china is gorgeous - and your tea time was just perfect today, thank you so much. Your dumpling looks SO DELICIOUS! Smiles and friendship to you! This looks like a perfect tea for the fall. The teapot and cups are so pretty. What a lovely leaf-inspired tea set! Your rose hips are so bright and pretty. Those dumplings do resemble our filled pastry donuts here in Canada. 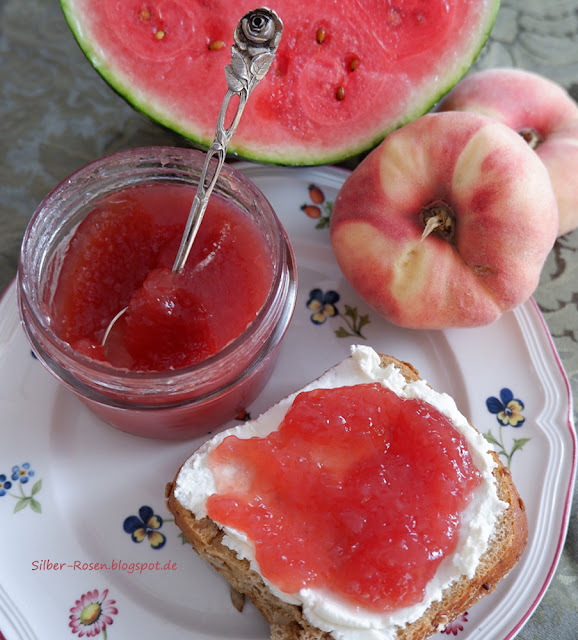 Yours look yummy, and would be a treat with your tea. Thank you for joining me for Tea Time and have a beautiful week, my friend. Those fall colors are gorgeous. 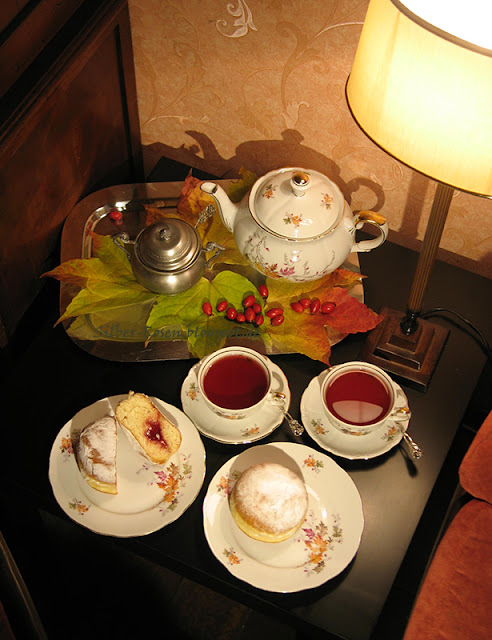 A perfect autumn tea! I love that china pattern, and your tea settings looks so cozy and inviting. Have a wonderful week. Wow, what a lovely tea setting again. You are a master stylist; each and every time you surprise us big time. Oh, the time is going so fast this year... but don't worry about your blog; you have been SO busy. Enjoy some time for yourself. ich freue mich immer wieder über deine Schönheiten. Aw, how your post reminds me of those very early evening we enjoyed in Mannheim, so long ago, (1972)! I would really have enjoyed it so much more if I ahd some of those dumplings to go along with my tea!I love your tea set... gorgeous! it all looks so cozy! 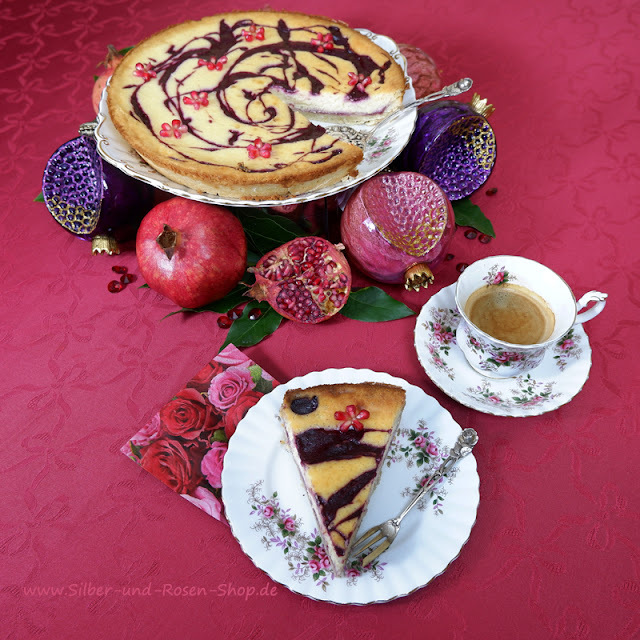 You are my first "linker" today and what a lovely posting with that darling tea set. Love the fall leaf motif. I love your setting near the sofa's as it looks so relaxing! Thank you for sharing at Friends Sharing Tea. das schaut doch einfach göttlich aus und so schön. Darf ich noch hinzu kommen? The dishes are gorgeous, they are perfect for an Autumn tea table and with those dounuts, simply delicious! How did I almost missed this lovely post, is beyond me! Wow! 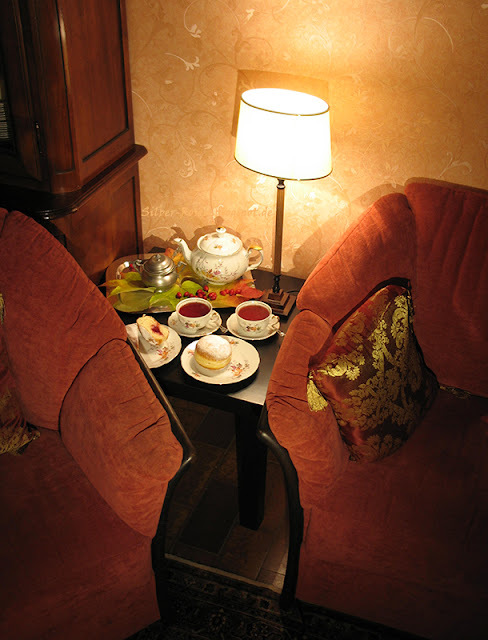 Enjoying the November tea by the comfortable seating area. 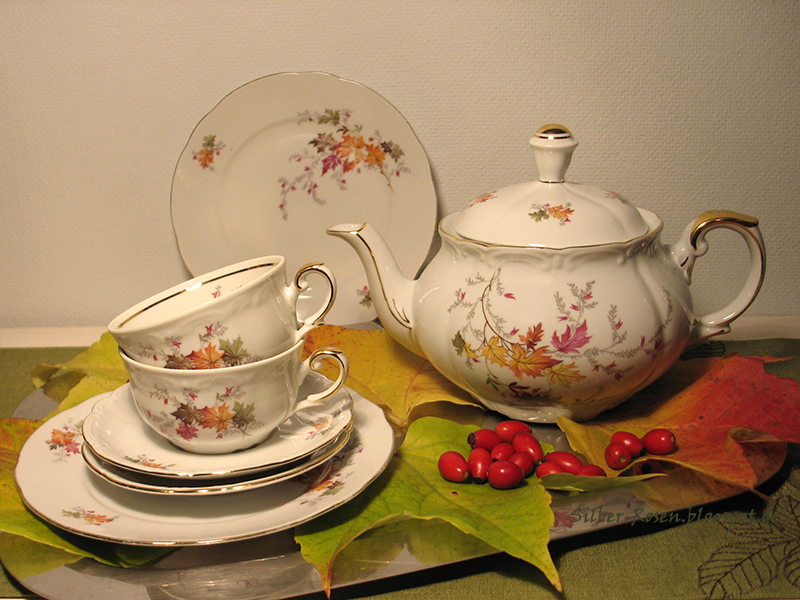 Your autumn leaves on the tea set is perfect for the season. Our weather is 67 today in Texas but coming Friday we will be in the 40's so we will be really enjoying hot tea on Friday plus a tasty dumpling/ donut! Have a great week! I would curl up in the chair with a good book and enjoy the goodies you have prepared as I read. Liebe Johanna. Jetzt starre ich ganz nah am Monitor auf das Herbstlaub-Geschirr. Das gleiche Motiv hat meine Mutti als Kaffeegedeck, allerdings glaub ich ohne Goldrand. Muss mal dran denken zu fotografieren, wenn ich das nächste Mal bei ihr bin. Danke für den angebotenen Tee, den trinke ich zur Zeit sehr viel.